Charlotte Herridge was one of the intrepid pioneer women who came to Canada from England just after the turn of the century. With her husband, William and their two sons, Herbert and Archie, they first settled in Winnipeg, but soon decided that the sub-zero prairie weather was not for them. They had read the ads put out by the Frontier Investment Land Co. describing the land in the Nakusp area and the idea of fruit farming. William had trained as a haberdasher and Charlotte had run an exclusive boarding house in England, which did little to prepare them for this drastic change in their lifestyle. After they arrived in Nakusp, they proceeded to walk to Glenbank over rocks and roots on the trail, which did nothing to impress Charlotte. When she viewed the primeval forest which was their land, she refused to participate in working on the property. But being an industrious woman, she soon settled the family into a small building north of the Grand Hotel and secured work at the Leland Hotel. Willie did odd jobs and poked away at his ‘estate’ on the hill. In 1908, the opportunity came to rent Columbia House, a small hotel that was built in 1898. By re-arranging the rooms somewhat, Charlotte could take in boarders as well has have ample room for her family. The building next to Columbia house – now known as the Bon Marche – at this time served as a butcher shop. It is thought Pat Burns was the owner. Charlotte had the opportunity to run the shop in conjunction with Columbia House. In 1910, Nakusp had its first lady butcher. However, it became too much work for them, so they kept the butcher shop and sold the Columbia House business to another family. Little had been done at the ranch. Willie had obtained a 160 acre pre-emption above Glenbank after moving to Nakusp and constructed a little log house new the top, which served as a home base for hunting forays and trips to the hot springs. Improvements had to be made on the pre-emption each year, which were the terms you had to adhere to keep the land. Charlotte continued to manage the butcher shop, but was always there to lend a hand to those less fortunate than herself. She nursed the ill and visited the elderly and infirm, sending out food when she knew they were not able to provide for themselves. Although Charlotte had an imperious, even haughty nature, she had a genuine concern for other people. In 1913, Alfred Harvey-Smith rented her butcher shop and set up a co-op store there – Charlotte was happy to give up the heavy work. She and the family continued to live in the back and the upstairs of the building. By this time Willie had found enough work to support the family and Charlotte could work in many of the new organizations that were formed to promote the community. When the flu epidemic hit in 1918, Charlotte pitched in and cooked and delivered gallons of soup to those afflicted. She didn’t contract the disease, but the two girls she looked after did. With good care and nursing, they soon recovered. Charlotte found time to belong to the Hospital Auxiliary and to work towards supplying necessary items needed for the hospital and to improve the facility. She also organized a chapter of the Women’s Institute in Nakusp in 1909. The woman who started this organization had lost a baby due to spoiled milk because of the difficulty of food preservation. Soon there were institutes all across Canada to assist young mothers in the safe handling of food for their families. The women then went on to learn first aid and life saving. They were also involved with the fruit fairs and assisted at the schools and hospital. When the Myrtle Lodge No 16 of the Pythian Sisters was formed in 1902, Charlotte became a charter member. Meanwhile, Willie and Archie worked sporadically at the 10 acres in Glenbank and at long last, they had five acres cleared and some fruit trees planted. It was hard work with only horses and dynamite to rid the hillside of its thick growth of trees. They also built a log cabin on the property and hoped to glean a living from the previously inhospitable land. Under Thomas Abriel’s tutelage, Willie also had become very proficient at painting and wallpapering and was much sought after to work in the area. 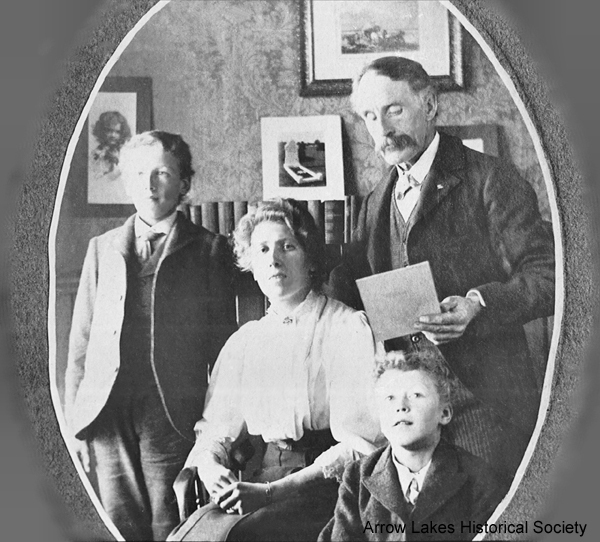 Their oldest son, Bert, had gone to the Ontario Agricultural College for a few years and then went off to war, enlisting with the first group to leave from Nakusp. In 1916, he was severely wounded by shrapnel to his right arm and nearly died from loss of blood. He did lose the use of the hand, but was brought through the ordeal mainly due to nurse Ella Leppingwell, who looked after him. They fell in love and married. Bert brought his bride home to Nakusp in 1918. They lived on the ranch which was given to them as a wedding present. As the years passed, Bert became interested in politics, first as a Liberal. He then switched to the CCF party. He was a member of the BC legislature representing Rossland-Trail from 1941 to 1945. Resigning his seat to seek a federal seat for the NDP, he successfully served from 1945 to 1968. His wit and dogged though unsuccessful fight against the Canada-U.S. treaty for Columbia River development gave him national recognition. When he retired, he lived out the remainder of his life at his residence at Shoreholme, north of Nakusp. Archie, their younger son, was a very capable man of diverse occupations. He was employed by the Canadian Pacific Railway in his early years and then became the mining recorder and registrar of births, deaths, and marriages in 1934. He then became the Justice of the Peace in 1936 and was foreman of Bell Pole Co. for several years. From 1958 to 1963, he served as the Arrow Lakes Hospital administrator. He was also active in many organizations to improve Nakusp in its many facets of development. In later years, Charlotte enjoyed many crafts and taught young people to do the same. She took over her store again (Bob Marche) and also displayed many items she produced. However, she was forced to give up the store – selling out to the Mayohs in 1942 – when her rheumatism became so severe that she could not continue. Willie, at the grand old age of 89 years, suffered a stroke in 1946 from which he did not recover. When Charlotte died in hospital in the Herridge Ward at 77 years of age in 1950, Nakusp lost one of its finest female entrepreneurs.